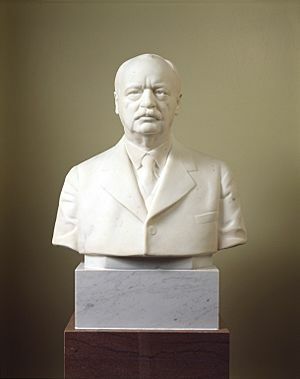 Charles Curtis (January 25, 1860 – February 8, 1936) was an American attorney and politician, elected as the 31st Vice President of the United States (1929–1933) with President Herbert Hoover. After serving as a United States Representative and being repeatedly re-elected as United States Senator from Kansas, Curtis was chosen as Senate Majority Leader by his Republican colleagues. Born in Kansas Territory to a mother of the Kaw Nation, Curtis was the first person with significant Native American ancestry and the first person with acknowledged non-European ancestry to reach either of the highest offices in the United States government's executive branch. He also was an Executive Branch officer, born in a territory rather than a state. Curtis ran as the running mate for Herbert Hoover in 1928. They won a landslide victory; winning forty out of the forty-eight states at the time, and 58.2% of the vote. 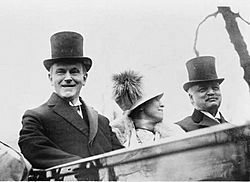 When they ran together seeking re-election in 1932, because Hoover had failed to alleviate the Great Depression, the public elected Democrats Franklin D. Roosevelt and John Nance Garner. After the Stock Market Crash in 1929, the problems of the Great Depression led to the defeat of the Republican ticket in the next election. Democrat Franklin D. Roosevelt was elected as president by a margin of 57% to 40% in 1932. Curtis' term as Vice President ended on March 4, 1933, and he was succeeded by John Nance Garner. 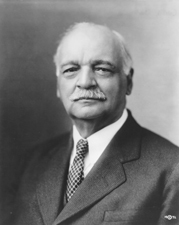 Charles Curtis Facts for Kids. Kiddle Encyclopedia.